Ah the NES! It's old but still great. And with a few mods and tweaks, it can get even better. 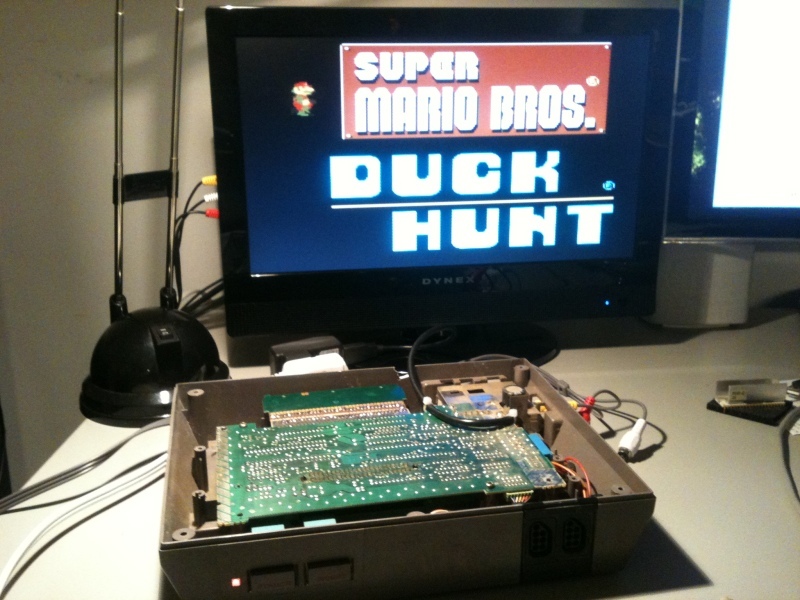 This page resumes some of the improvements or mods that can be done to a NES system. I own a nintendo game cartridge named 260 in one, which is full of fun games. The only drawback is that once you select a game, you must reset the nes to return to the main menu. To fix this little problem, I have added a connector to my NES where I can connect a long wire to reset the NES remotely. 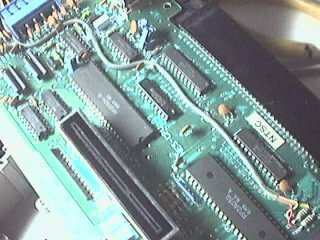 1) Open your NES and remove the metal sheet isolating the mother board. Also remove the motherboard. This is necessary to gain access to the small PCB where the Power and Reset buttons are located. 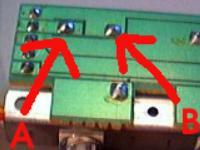 2) You also need ot remove the reset/power PCB from the case, since you need to solder on the solder side of the PCB. 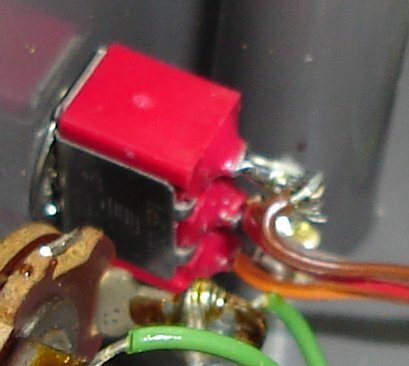 3) Solder your wires on the reset button. 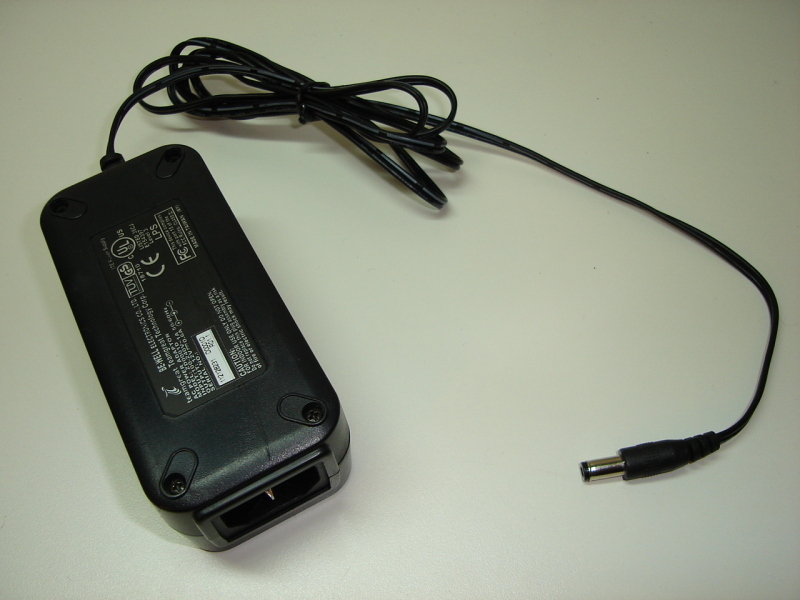 4) Install the connector on the case, and solder the wires coming from the reset button on it. As you can see, it is very simple. I used a 1/4 jack, as for headphones. The cable is so simple that I will not include pictures of it on this page. I did not install a button at the other end, I just touch the wires together. The NES has been designed to output mono sound. This was acceptable back then, but nowadays we expect/need stereo outputs. 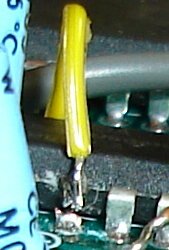 If you wish to connect your NES to a stereo amplifier, you need an Y cable. You will hear the same sound in both speakers. It is possible to do better by modding the NES to add "real" stereo sound. 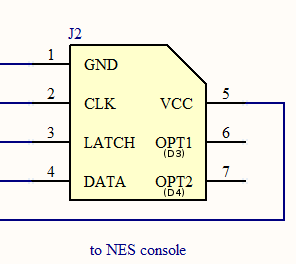 The NES CPU (2A03) has 2 sound outputs. One carries the 2 square wave channels and the other one carries the triangle wave channel, the noise channel and the sample channel. 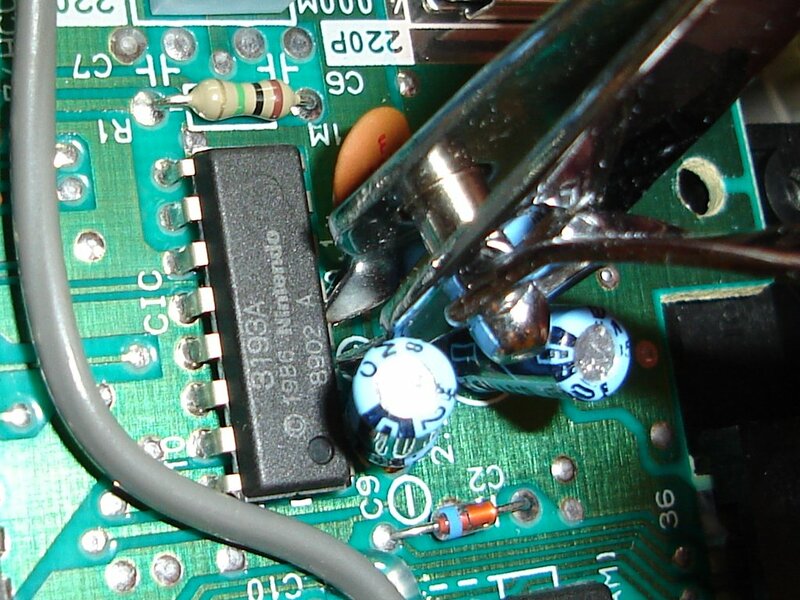 By tapping directly on the CPU pins (that is, before the mixing is done), it is possible to direct the 2 sound outputs to different speakers, thus obtaining stereo sound. The knob on the picture is not a volume adjustment, it controls the stereo separation. The games were not designed for stereo, and it can be heard. Keeping a small amount (adjustable) of mono sound gives better results. This mod has been described elsewhere, and the value used for the potentiometer is not always 10k. 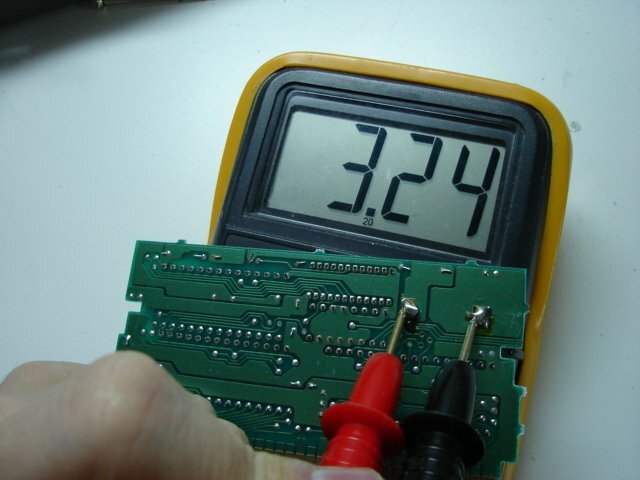 Using a higher value potentiometer means a higher maximum resistance value. In theory, this means less mono sound and greater separation when the potentiometers are in the "maximum resistance" position. That said, using a very high potentiometer (eg: 100k) would probably result in being able to hear mono sound for only a small area of the potentiometer range (eg: 1/8 of a turn), and increased adjustment sensitivity and difficulty. The best approach is probably to experiment, starting with the potentiometers you have on hand, and decide what works best for your ears. On the left: The sound is taken right from the CPU pins. I used a shielded cable, to prevent picking up noise. On the right: I tapped on one of the pins connecting the [power supply, RF modulator and RCA Mono audio/video output module] to get mono sound. Better be carful to use the right pin since there's the 12 Volts AC from the AC adapter on the same connector. I routed the cable over the motherboard in a way that makes it possible to easily reinstall the metal shield. I few drops of hot glue here and there helped keep the cable in place. 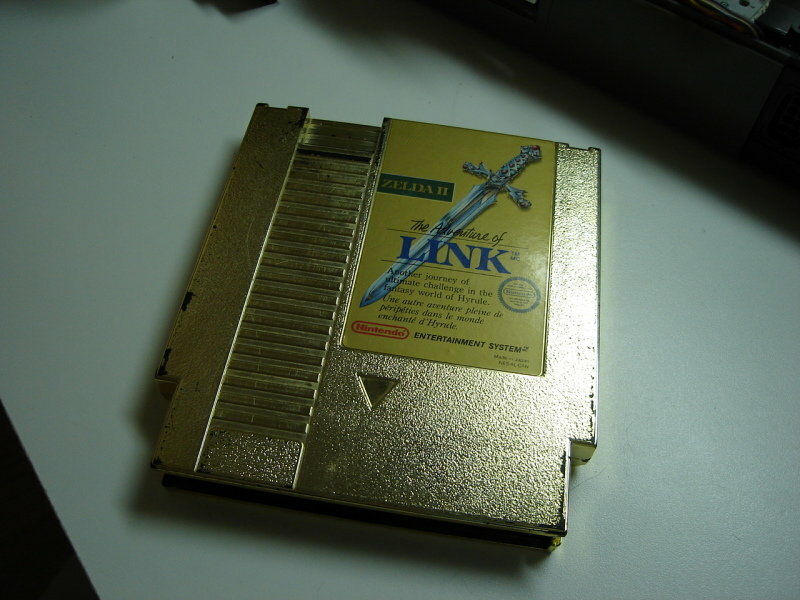 This is not a mod on the NES itself, but it is on topic. I modified a cartridge in a way that makes it reprogrammable. This project is on it's own page. 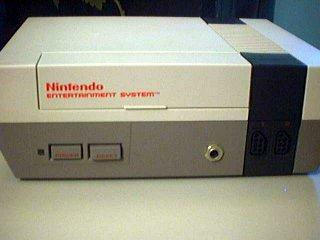 When nintendo designed the NES, they equipped it with a lockout chip. The main reasons why they did this was (1) to prevent unlicensed companies to distribute their own software and (2) make it harder to copy games. (Just imagine yourself buying a game and reading in the manual that you must mod your NES in order to be able to play!...). The chip also makes it impossible to play imported games. How does the chip works? 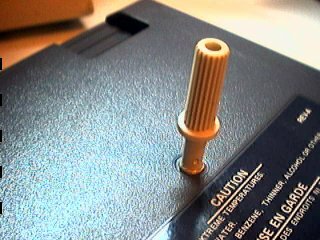 The lockout chip is used in both the console and the cartridge. 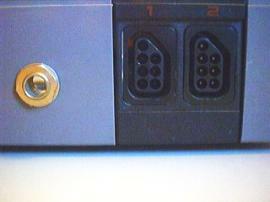 Depending on the logic level on pin #4, the chip will run in lock mode (console), or key mode (cartridge). 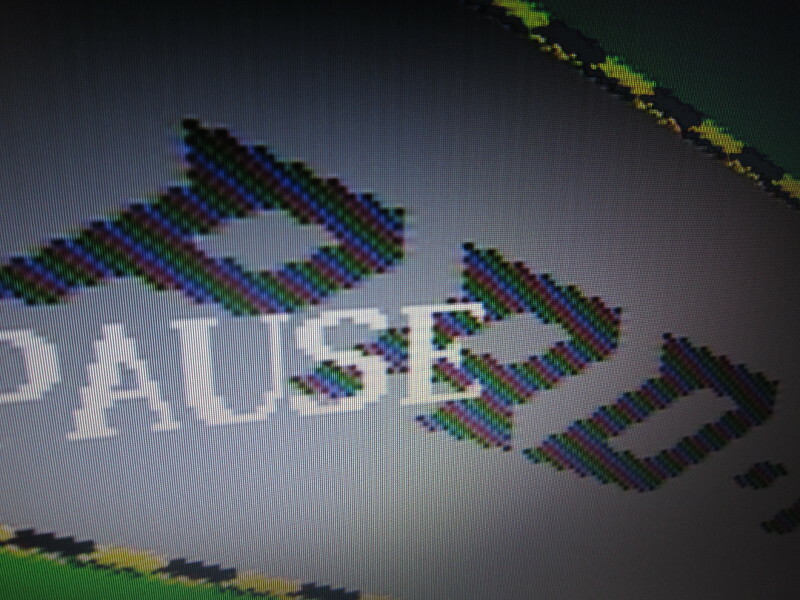 When the NES is on, the chips normally try to communicate together using 3 signals. 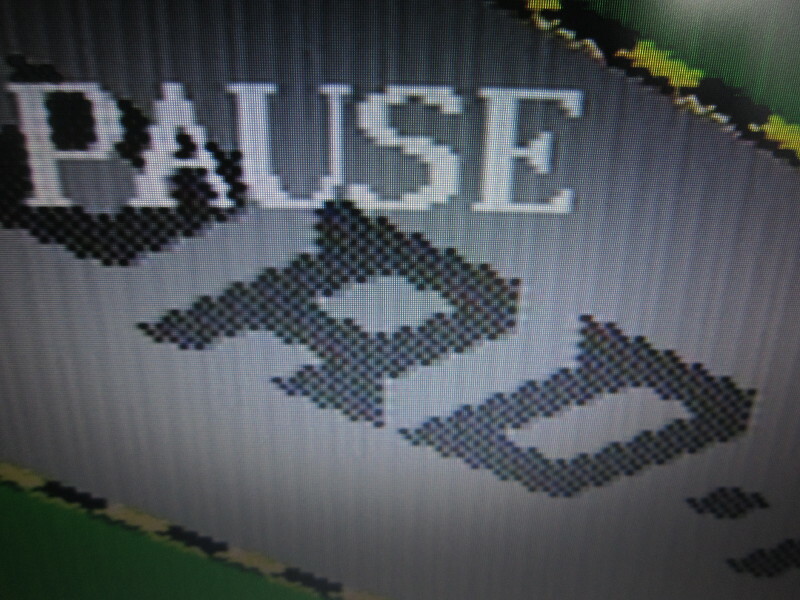 As long as the communication is not working correcly (no chip in cartridge or bad chip in cartridge), the lockout chip inside the NES will generate resets at 1 second intervals. To be able to build your own NES cartridge without needing to remove the lockout chip from another cartridge. To be able to use imported games without special adaptors. All you need to do is put both chips in key mode. When both lockout chips are in key mode, nothing happens (so no resets). 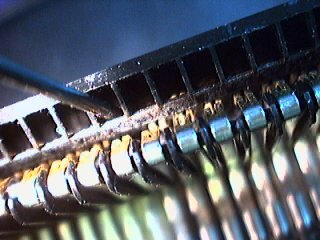 To do this, you must disconnect lockout chip pin 4 from the motherboard and connect it to a ground (lockout chip pin 11,12,13,14 or 15). 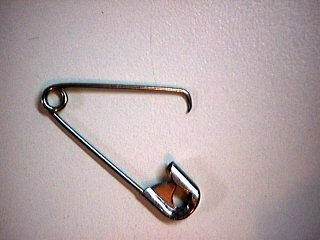 It will also work if pin 4 is not connected at all, so dont worry if you accidentally rip it off. Even though it works without connection pin 4 to ground, I beleive it is better to do it anyway. I was a little worried that some cartridges would stop working due to this mod (cartridge with smarter lockout chip?) so I added a switch to control the voltage on pin #4. I have not encountered such cartridges yet, but the switch is there, just in case. 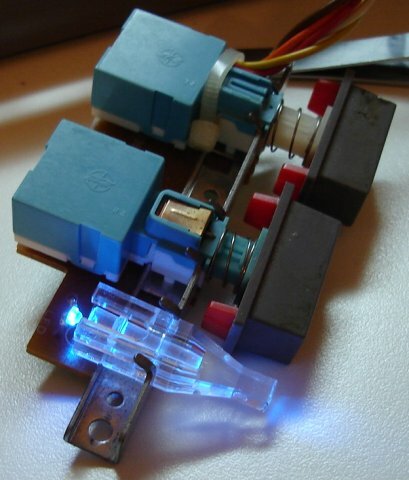 Nowadays, Blue leds are very trendy and are used everywhere. I tried to resist the temptation, but couldn't. So that's right, I've replaced the boring red power led by a blue led, because "It's cool"! You simply unsolder the old led, and solder your blue led. In my case, I had a surface mount led so I soldered it on the old led's leads. I bought the led from digikey. They have shipping and handling fees so if you only need one led, find a local electronic component store and buy the led from them. It is bulky, which is not very convenient when you're carrying your NES in a pack sack. It covers almost 3 sockets when you plug it in a power bar. It has an AC output, which is rarer. It is hard to find a perfect replacement. By looking at the NES schematics, I saw that the power coming from the power supply is converted to DC and lowered to 5 volts using a simple lm7805 voltage regulator. This means that giving 12 volts to the NES will not damage it (however, please note that the regulator will generate a little more heat). Since the NES expects AC, you can supply the NES with DC power without having to check the polarity. Switching power supplies are usually smaller than linear power supplies, so I have used the switching power supply that came with my old cable modem. It gives 12 volts up to 0.6 amps. So far, it has worked flawlessly with the NES. So you have a game that does not start anymore? The screen repeatedly blinks? 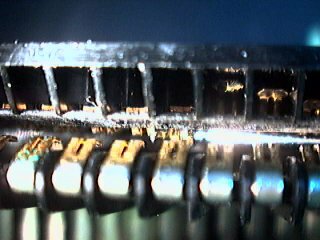 This could be caused by a dirty NES cartridge connector or dirty cartridge contacts. Since it's easier to clean the cartridge, it is better to try this first. 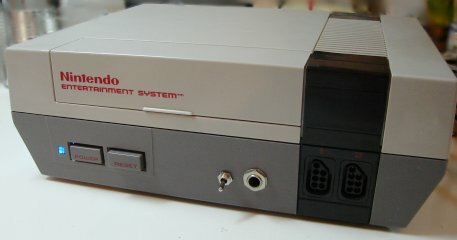 If it does not work, you might need to restore the cartridge connector inside the NES. I will now show you how I clean my NES cartridges. Buy the right tool. nintendorepairshop.com sells it. 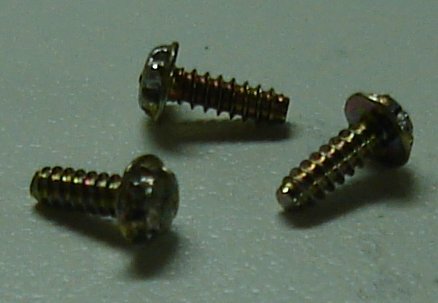 Take one or two small flathead screedrivers and try to use the notchs in the screw's head to unscrew it. I remember reading somewhere that you can heat the screws with a soldering iron and pull them out when the plastic starts melting. 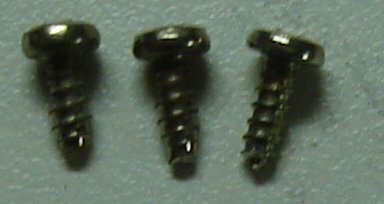 You use slightly bigger screws to close the cartridge. 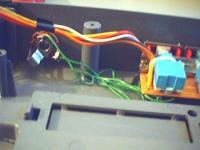 Finally, I close the cartridge with ordinary screws so it will be easy to open in the future. For reference: The tool to open the NES Power Pad is a gamebit 4.5mm screwdriver. Blinking screen and non-working games? 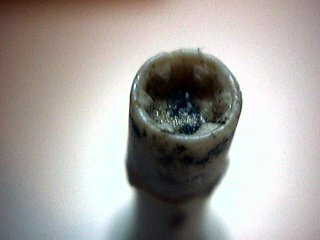 If cleaning your cartridge does not do it, you probaly need to restore or replace the internal cartridge connector. 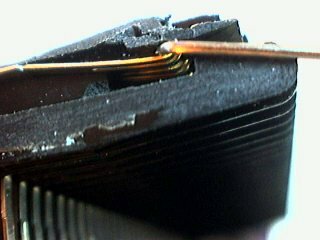 The cartridge connector inside the nes it very bad. 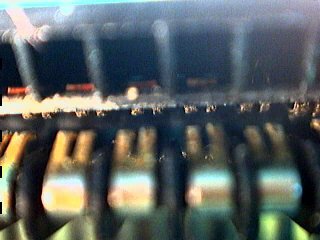 The problem is that the metal contacts are applied to the cartridge PCB vertically instead of horizontally (which would move the dust and oxyde out of the way). Fortunately, there is a way to fix this problem. You need to tweak the connector such that the contacts are closer together. 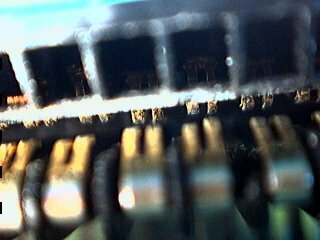 There will be more friction when a cartridge is inserted and the fact that the contacts are more tightly pressed on the cartridge pcb will result in a more relable cartridge connector. If you would prefer to replace the connector, you can buy one from the Nintendo Repair Shop. 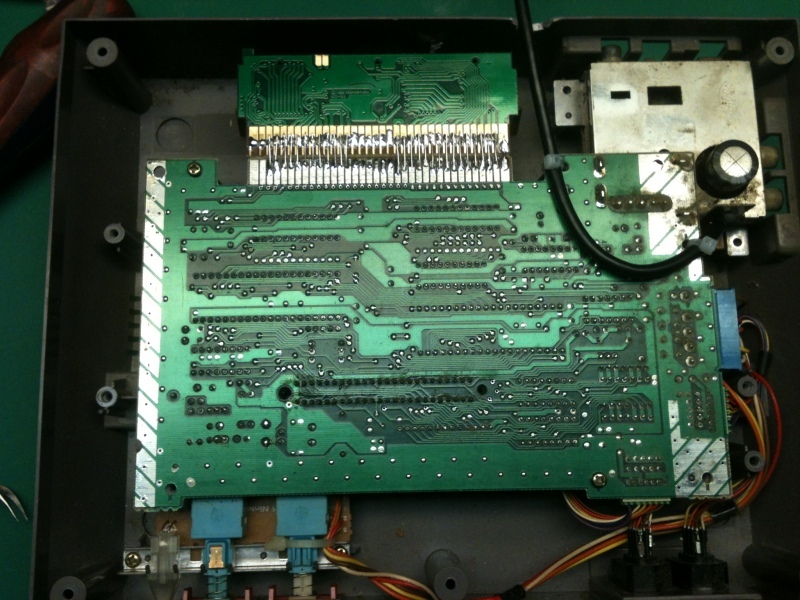 Disassemble your nes and remove the cartridge connector. 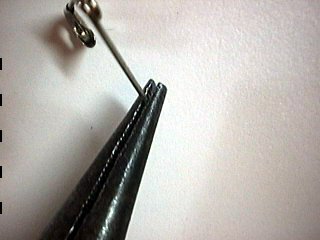 Find a cloth pin and bend the tip. Using the pin, try to pull the contacts closer to the center. Do this for the upper row (the one near the square holes) and the bottom row. The contacts should now be nearer to each other than they were before. You dont need to do anything to the part of the connector which connects to the NES motherboard. Reassemble your nes, and enjoy! The games should work pretty well now. They will even work without pushing the cartridge down! 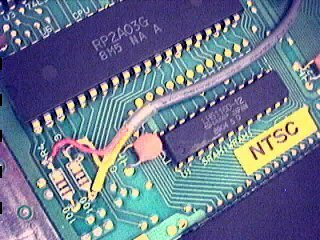 If the cartridge connector of your NES is not usable anymore but the system otherwise works, you can hardwire a game by soldering wires between a cartridge and the NES motherboard. Say goodbye to flashing power LED problems, non-starging game, glitching games, but also to the ability to change game. 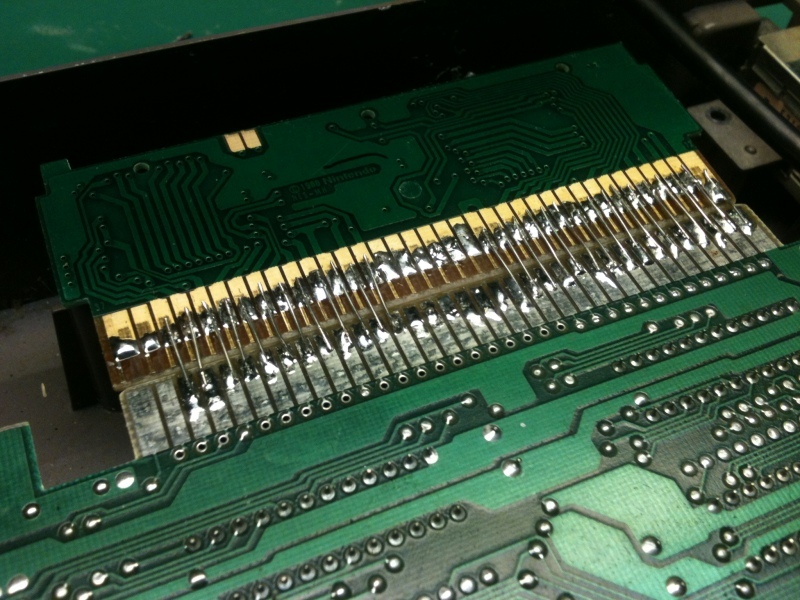 Look at the cartridge PCB carefully and save time by not wiring unused contacts. Triple-check the orientation. Making a mistake is easy. Please don't use a rare or otherwise precious game cartridge. Nintendo did not think necessary to have a composite video output on the NES2 console. Also, there appears to be an interference problem on the PCB causing vertical stripes (see comparative pictures below) across the screen. I modified a NES2 console to capture the video signal directly at the PPU output pin. To reduce interference, I cut the pin so that it would not contact the PCB, but cutting the corresponding PCB track would also work. I also used coaxial cable for wiring. To amplify the video signal before sending it to the TV monitor, I used my 3 Channel video buffer circuit. After the mod, the jailbars are almost gone. In fact, they are as faint as they were with the original NES. It has been known for a long time that using SNES controllers on a NES was possible and easy to do using simple wiring. So this is nothing new, but since I recently (2014) built such an adapter, I just thought I'd document it here. Anyone who has looked at how SNES and NES controllers work knows that those are simple shift registers. A button state snapshot is first taken using the LATCH signal. 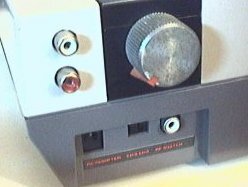 The bits corresponding to each button are then transmitted serially on the DATA line, at a pace controlled by the CLOCK signal. As SNES controllers have more buttons than NES controllers, an SNES console has to send 12 to 16 clock pulse to read all buttons while a NES console only sends 8 pulses. Notice how the SNES B/Y maps to NES buttons A/B. It might seem wrong at first that the B and A buttons be swapped, but it is in fact exactly what's needed given the physical button layout. For instance, in the NES Super Mario, B=run, A=jump. In Super Mario World on the SNES, Y=run, B=jump. So when playing Super Mario on the NES using an SNES controllers, Y=run, B=jump. It feels perfectly natural. Here a picture of an adapter I built using an SNES and NES extension. The wires were soldered and then insulated using heat-shrink tubing. Warning: Do NOT rely on the wire colors shown in the above pictures. The relationship between pin numbers and wire color varies according to the cable manufacturer, and sometimes even between batches. 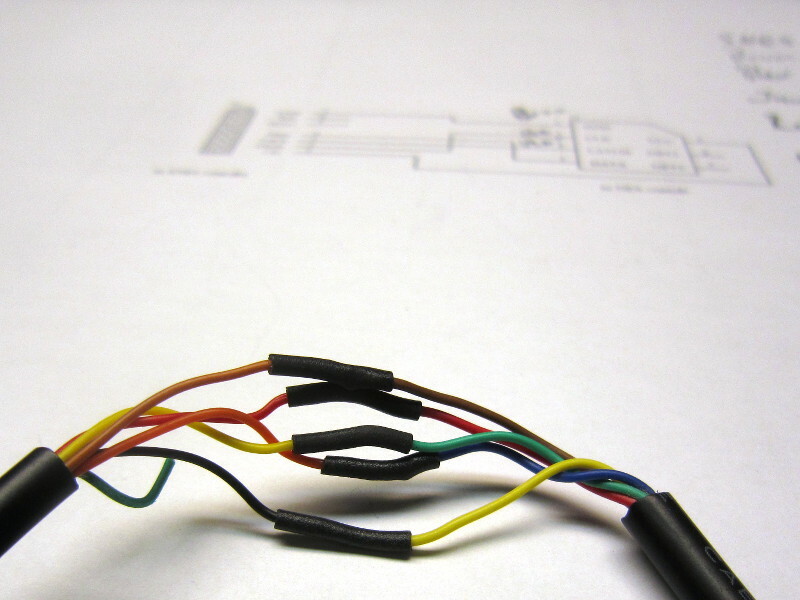 You must find out the color code used by your cables using a continuity tester. Blindly following the colors seen here may damage your NES or SNES controller. 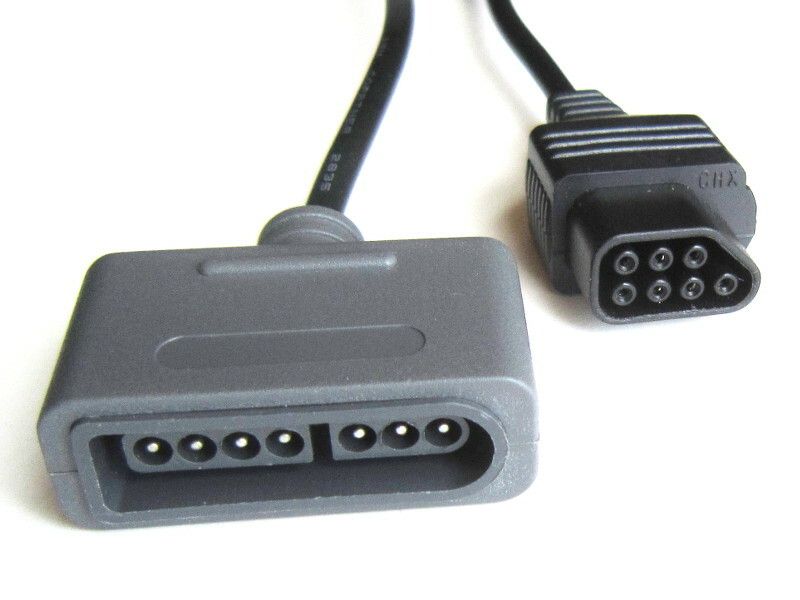 Note: This adapter works on the NES, but also on the AV Famicom which has the same type of connector for controllers. If you are looking for a ready-made adapter, you can buy one from my online store. Games feel different when played with an arcade style controller. Also, if you are playing arcade game ports, you will get a more authentic gameplay. Please visit my Arcade style controller for Snes, Nes and PC page for instructions to build one yourself. I modified a NES to be able to play old Nintendo arcade roms on it. This project is quite complex so it has it's own page. I have been asked how one could add turbo buttons to a regular controller. I don't have the time to do it, but here is what I suggest if using a micro-controller must be avoided. (Sincerely, it would be quicker for me just to grab one of my multiuse pcb2 boards and write a special firmware). Add a CD4013 D type flip flop. Clock it using the latch signal from the NES. Route the inverted output to the data input so on each clock edge the output toggles between high and low. 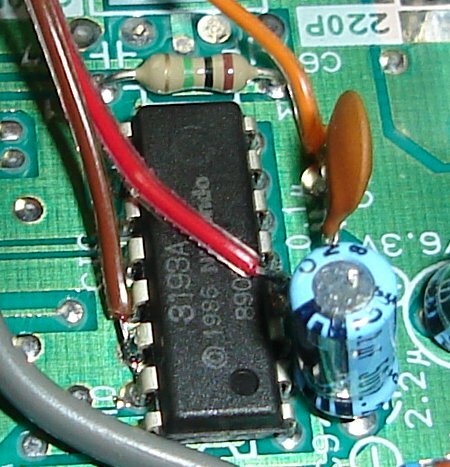 The non-inverted output of this flip flop would then go to each of your turbo buttons, which, when pushed, would pull the non-gnd side for the button being turbo'ified to GND through a transistor. The CD4013 chip contains two flip flops so you could chain them to slow down the turbo to 15Hz if 30Hz is too high. Another approach would be to use the famous 555 IC. 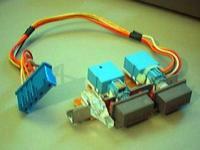 A variable resistor could then control the rate of the Turbo. 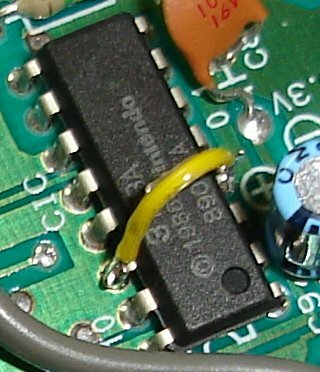 The 555 output would be distributed to the turbo buttons as explained above. Note: If you mod a controller using the technique outlined above, please let me know and send me pictures to add here! Note: Many NES extension cables are meant only for controllers and do not wire pins 6 and 7! If you have no other choice, a Zapper can be sacrified for its cable.